Western style riders wear pants made of denim (jeans), but it's a good idea to protect them with chaps. Chaps are made of leather or suede, and may have fringe. English riders will wear riding breeches that fir very snugly. There are different kinds of breeches, some with suede patches inside the knees, and others with the suede running from the knees all the way up and around the backside. These are the best. Some riders like to color coordinate their shirt with the horse's coloring, and the styles will change from time to time. boots and even ankle-high paddock boots. 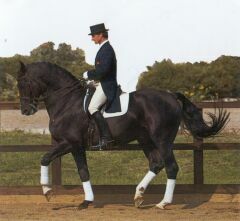 English riders, in competition, wear knee-high leather boots. Leather (not rubber) heels are best. Never wear sneakers (tennis shoes) when riding as they can be slippery in the stirrups. When working around the barn, wear sturdy and waterproof boots. Western riders wear a traditional cowboy hat, many can be very fancy. English riders can wear a derby hat or a cap with a button on top, but generally today usually wear helmets. This helmet must be ASTM-certified. Helmets come in various styles but with few color choices. The helmet with the button at the top is the common choice. Be sure your helmet fits snugly, has ample ventilation, and look into decorative helmet covers. Many riders chose not to wear a helmet because they complain that they're too hot or they flatten the hair. But think about it, the helmet's job is to provide a stopping distance between your head and the ground. A fall on the head causes the brain to ricochet inside the skull, which causes bruising and swelling. With this in mind, designers have built into the helmet a "bubble wrap" system. The padding of your helmet has been injected with millions of gas bubbles set in many layers. When you fall, the bubbles burst, taking much of the impact. The idea is that the bursting will slow the impact and help keep bruising down to a minimum. The outside shell of the helmet offers protection against outside factors such as hooves, rocks and branches. Safety vests are lightweight and comfortable, though expensive. If you do a lot of jumping or are starting young horses under saddle, definitely consider one. Read the next horse tack article on Horse Saddles.